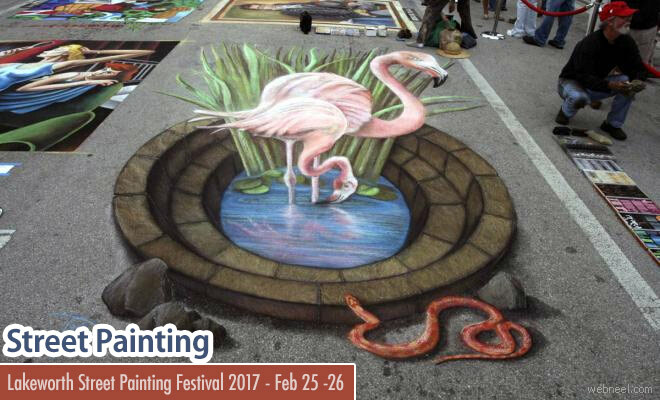 The Lakeworth Street Painting Festivals is one of the most popular annual street art held in Florida. This year it is scheduled on these two days February 25 - 26. More than 600 artists will be participating in this event with eco friendly chalks and will transform the Lake and Lucerene avenues, pavements into traditional, contemporary and 3D illusionist paintings on the street. This event is known as one of the largest street painting event across the world. Last year two artists recreated the beatles walking on the road and it was all 3D Street art painting. We will have to wait and watch to see the surprise artworks until February. This event was started in 1994 and Street art has undergone a lot of changes comparatively. It's free admission, so book your tickets early and have fun. The Tradition of Street Painting: Traced back to 16th century Italy when itinerant artists would use their chalks to transform pavement into a makeshift canvas, street painting has retained its appeal through the centuries. As in ages past, crowds still gather to watch as fine works of art emerge. The “paintings” last only until the next rain, but the lively spirit and accessibility of the exhibition captivates new audiences each year and inspires lasting memories.